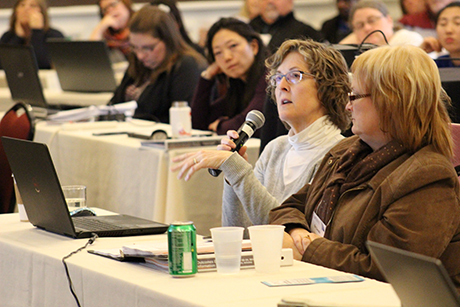 CARF’s 2018 Winter Transforming Outcomes Institute concluded on February 24, 2018. It hosted more than 100 participants in Tucson, AZ. Here’s the breakdown of the training. 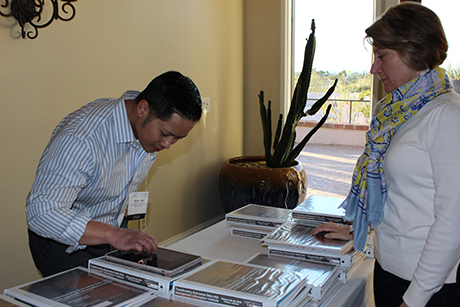 CARF Resource Specialist Ron Tran completes check-in and distributes course materials to participants. 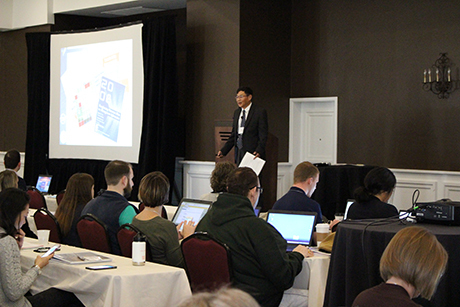 CARF Chief Research Officer Di Shen, Ph.D., paid homage to Transforming Outcomes’ 20-year history. Participants explored the facility and surrounding area during afternoon breaks. 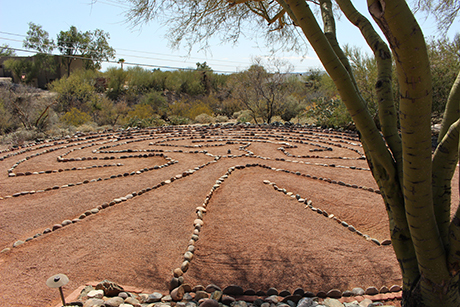 The training was held at Westward Look in Tucson, AZ, which boasts a variety of activities, including nature trails, a stone path labyrinth (pictured above), horseback riding, and bicycling. 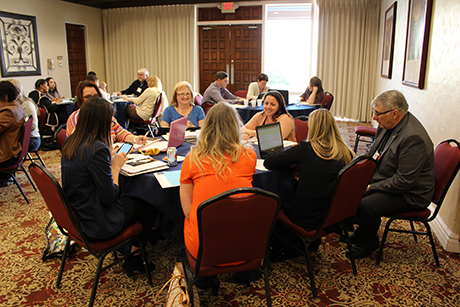 As a wrap up to day one, participants worked individually or in small groups to create performance objectives and indicators that align with their own organization’s mission and values. In this activity, participants gained hands-on experience using CARF’s Walker Grid to create their performance measurement and management systems. The Walker Grid is a framework tool that helps organizations identify outcomes and performance indicators that address consumer outcomes. A sample Walker Grid can be found in the complimentary publication: CARF Performance Management Workbook: A Six-Step Guide. Discussing their results with the large group helped participants better understand how to apply concepts learned during the day’s sessions. Participants also had the opportunity to constructively critique others and work collaboratively to edit their CARF Walker Grids as needed. 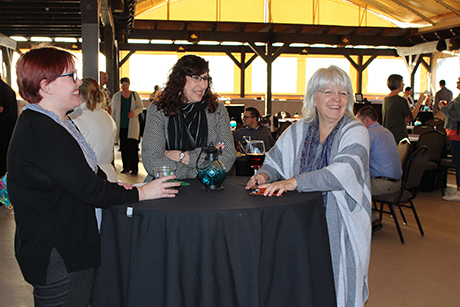 After day one sessions, participants and CARF staff relaxed and unwound during a reception on the hotel’s rooftop patio. Everyone seemed to appreciate the delicious food, discussions, and desert views. 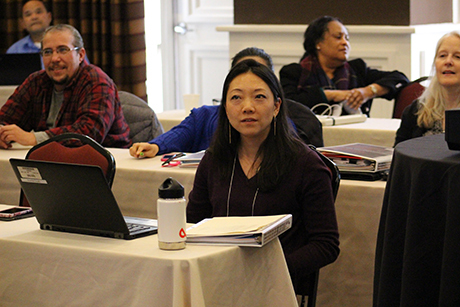 On the second day, participants broke into five lab groups to learn how to manipulate, analyze, and interpret data into information that an organization can use for performance improvement. 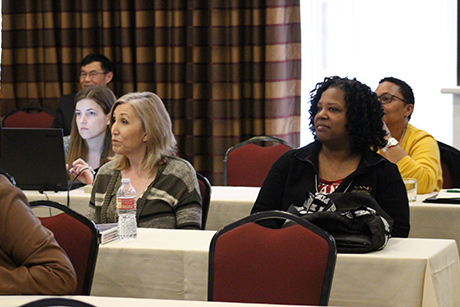 Participants attended one of three concurrent sessions to learn about goal attainment scaling, outcomes measurement research, or how to link files for database management. 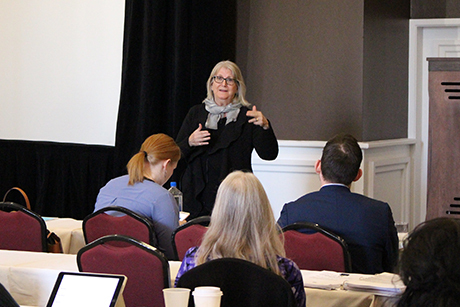 Mary Slavin of Boston University encouraged participants to engage in discussion about subgroup analysis and outcomes of persons served. Throughout the sessions, CARF and Boston University staff provided one-on-one consultation and support to training participants. 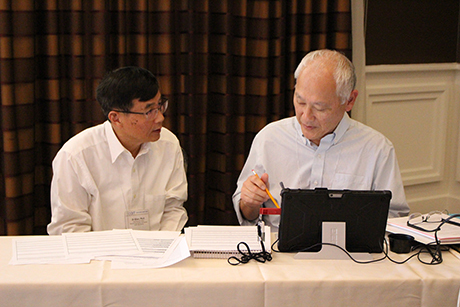 Above, Di Shen works with Canadian participant Gord Hirano on how he can apply concepts learned in sessions to his own organization. 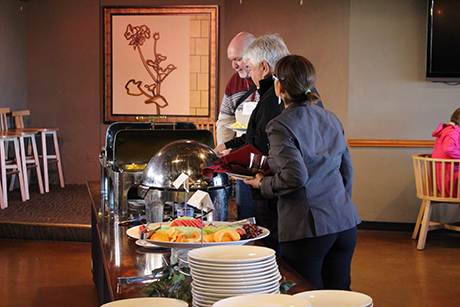 Participants enjoy breakfast on the last day of the institute. 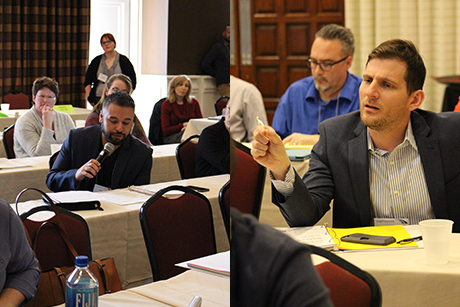 During a session on how to present data in management reports, participants discussed how to determine if findings are representative of the population served and how to interpret results. Participants also reviewed next steps such as gaining additional information from various stakeholders and planning for performance improvement. An afternoon review session included a Transforming Outcomes-themed version of Jeopardy. Teams competed to demonstrate their understanding of course material and knowledge. 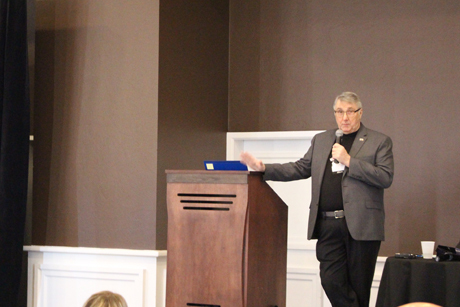 To conclude the training institute, CARF Surveyor Jim Baxter reviewed how to summarize performance measurement findings, make recommendations, and create a plan for future action. Thank you, Dr. Kimani. The Transforming Outcomes Institute is a staple CARF educational event and the word has been getting out. I believe we've set an attendance record at the winter institutes each of the past 2 years. Looking at the outline and activities associated with Transforming Outcome Institute, It looks like participants were excited about the workshops. The information shared would be beneficial to any organization trying to assess performance at different levels of the organization. May the Institute and CARF continue to provide learning opportunities like this. Thank you for your kind comment, Heidi! So many staff here work hard to make the Transforming Outcome institute valuable and we appreciate your words (and hard work as well). It was a great training! I learned so much that I can bring back to my organization. The hands on was super helpful and the practice just made it more user-friendly. Thanks for putting on such a great training! Thank you, Thomas. You as well. Was Stacy able to attend the institute? Thank you for Blog Sharing this article about your seminar. I am a member at Sedona Home also known as Charlotte's place in Sanford, Florida. My name is Thomas Sprys. I am with the group here. I hoe the seminar was productive, and wonderful. Pleasant gathering are always nice. Stacy is the Director of our services. She is very talented at what she does, and all clients are happy with her direction. We are are very fateful for what she does for us. Thank you again for sharing about this seminar conference. Enjoy your day.